If you don’t like the weather, wait five minutes, to paraphrase Mark Twain. He spoke those words about New England, but the saying is equally true for our state. Even newcomers quickly learn to expect weather that changes as soon as we put on (or take off) our jacket. No matter how much we may look forward to winter, there comes a point when the view is nothing but cold and uninviting. Luckily, no matter where you are in the state, when you yearn to get away you can revise that old adage to read: If you don’t like the weather, drive a few miles. While spring getaways in Oregon may not be as sunny as Oaxaca, there are “banana belt” locations throughout the state where the temperatures can be nearly springlike, even in winter. It’s all about geography—elevation changes, primarily— that influence temperature and precipitation on both sides of the coast and Cascade mountain ranges. Several cities around the state, such as Medford, 150 miles inland from the south coast, and Hermiston, 275 miles inland from the mouth of the Columbia River, are much drier, and sunnier, than the Willamette Valley. Hermiston is on the eastern side of a rain shadow formed by the Cascade Range, while Medford’s proximity to high elevations all around it squeeze moisture out of storm systems before it reaches the city. Roseburg, nestled in a spur of the western Cascades in the southern part of the state, rarely accumulates snow, and the Pelton Dam area on the Deschutes River near Warm Springs sees fewer than ten inches of precipitation a year. Even Brookings, which sits right on the largest and deepest ocean in the world, has a pronounced banana belt climate that can make it tens of degrees warmer than many other parts of the state all year-round. 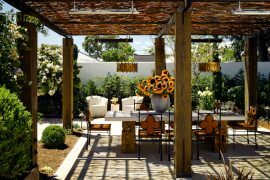 If you’re ready to hang up your snow shovel for a while and go somewhere to reacquaint yourself with the lemon-yellow sun, read on. If you’re looking for relatively warm spring conditions with very little snowfall, and you want to avoid strong coastal winds, Roseburg is a good place, said forecaster and incident meteorologist Noel Keene with the Medford Weather Forecast Office. Roseburg is only 525 feet above sea level, which generally keeps the snow well above town. Roseburg is also separated from the Willamette Valley, where cold air tends to pool. “The terrain around Roseburg, which makes for beautiful scenery, essentially isolates it from all but the coldest Arctic air outbreaks,” said Keene. 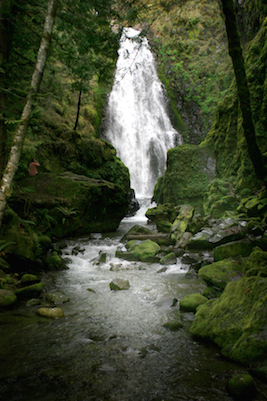 The Roseburg area is surrounded by more than a dozen waterfalls. Drive up Highway 138 about an hour to the trailhead for Susan Creek Falls, which climbs to just under 1,000 feet of elevation. “The .8-mile trail is accessible for most people and ends in a waterfall dropping fifty feet from the Umpqua River over mossy cliffs,” said Rachael Miller, with the Roseburg Chamber. Big fish can be viewed crossing the Winchester fish ladder all year. Oregon Department of Fish and Wildlife maintains a fish counting station at Winchester Dam not far from Roseburg off exit 129 from Interstate 5. The Winchester Dam was built in November 1890 and is on the National Register of Historical Places. “You’re beneath the water’s level so you can see up close to these huge fish,” said Miller. In January 2015, more than 3,000 fish, mostly winter steelhead, were observed crossing the fish ladder. 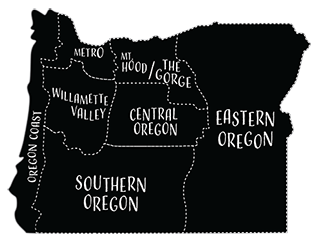 In January, Wine Enthusiast Magazine named Southern Oregon one of the “10 Best Wine Travel Destinations of 2016,” thanks in part to the twenty-plus wineries in and around Roseburg. Local wineries won twenty-eight medals in the 2016 San Francisco Chronicle wine competition out of a total of 7,162 entries. The state’s largest collection of natural history artifacts is on display at the Douglas County Museum, along with the state’s second-largest collection of historic photographs. More than 7,500 items tell the story of the past and present of the Umpqua River Valley, along with more than 24,000 images going back to the mid-nineteenth century. For your Friday or Saturday evening nightlife, visit Salud Restaurant & Brewery, which serves up Latin-inspired tapas and entrées. “If you’re lucky, Faith will be bartending,” said Miller. “Faith makes the most scrumptious concoctions.” If she can’t tell, or you’re not sure what you’re in the mood for, this intuitive bartender will ask a couple of questions and be able to make your drink dreams come true. “In Brookings there isn’t really winter, so nothing is different,” said Janelle Frazier, who now lives in Eugene but grew up in the town that might have Oregon’s most unchanging weather. January temperatures have been known to hit the 70s. Brookings is so warm that bulbs bloom in February, but that does come with a fair amount of rain and accompanying cloud cover and fog. Because the bay faces south, it avoids a lot of the wind that scours other long, open stretches of ocean beaches. Brookings is less than thirty miles from California’s Redwood National Park, and has its own forest of the tallest trees in the world. The Redwood Nature Trail winds through 800-yearold redwoods. Oregon Redwoods Trail is a 1.7-mile-loop that is wheelchair accessible and is populated with younger redwood specimens. 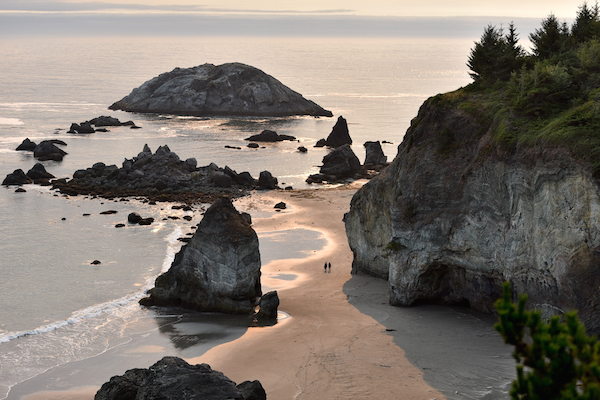 The Samuel H. Boardman State Scenic Corridor is twelve miles of forested and sandy coastline. “It offers beach combing, of course, but also miles of coastal trail and spectacular and unique ocean views,” said Frazier. On your way to the trail, stop by to see the Blake Monterey Cypress, the second largest Monterey in the world and the largest in Oregon. Planted in 1857, it has grown to more than 130 feet tall with a thirty-fivefoot circumference. “I don’t think it is widely known that the weather is nicer here,” said Phyllis Danielson, owner of Stokes Landing Bed and Breakfast in Irrigon, fifteen miles from Hermiston. The landscape in Hermiston, which skims the northern border of our state, gets only ten inches of precipitation yearly. The desert grassland landscape is much different than the verdant, foggy Willamette Valley. Stokes Landing is located right on the banks of the Columbia River. A wildlife refuge spans both sides of the water here, offering rich birdwatching. The twelve-mile-long Columbia River Heritage Trail parallels the waterway from Umatilla to Irrigon and on to Boardman. Unimproved and paved sections allow you to walk, bicycle, or horseback right along the river, passing interpretive panels marking “Sand Island,” where Lewis and Clark, Sacagawea, her French trapper husband, their infant son and the Corps of Discovery camped with native people harvesting clams in 1805. Kayaking is a year-round sport here, and the stretch of the Columbia between Boardman and Umatilla offers trophy walleye fishing—some of the greatest walleye water in the world, second only to the Great Lakes. If you stay somewhere along the Heritage Trail, walk it to the River Lodge and Grill in Boardman, where you can dine in a log lodge right on the water. The family-friendly Hermiston Brewing Company serves its own roster of beers out of a historic 1940s building that was built as a Plymouth dealership. Irrigon is opening its own visitor center in March. 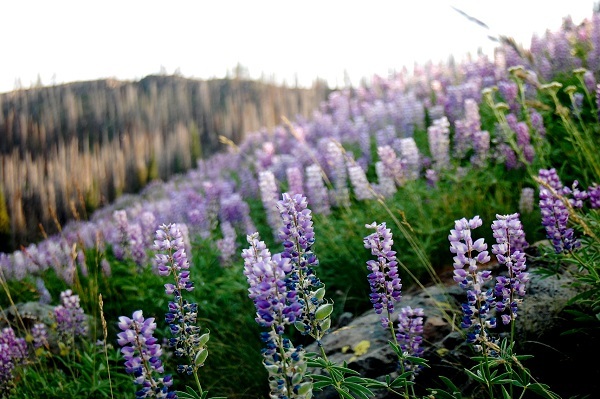 The Rogue Valley’s Medford is generally a sweet spot for mild spring conditions. The valley as a whole rarely gets snow, although winter mornings can bring freezing fog. “While Medford isn’t knee-deep in snowfall, storm systems typically dump a lot of snow in the mountains, and one can travel an hour or less to reach some of the white stuff,” said Medford’s forecaster Shad Keene. Indeed, Crater Lake, just seventy-five miles to the northeast, averages forty-four feet of snowfall yearly compared to Medford’s 4.1 inches. Rogue Creamery, in Central Point, has a cheese shop offering beer, wine, bread, crackers, meats, and, of course, samples and sales of Rogue’s delicious, award-winning cheeses. Stock up on snacks before heading to hike at Upper Table Rock or Lower Table Rock, two prominent volcanic plateaus that are easily seen and accessed from Central Point, just five miles from Medford. The rocks feature unique habitat including oak savannah and rare wildflowers. After hiking, the Frau Kemmling Schoolhaus Brewhaus in Jacksonville is just ten minutes away. Since opening in fall of 2010, the Brewhaus has become a popular place for schnitzel, brats, pretzels and German beers. If American food hits the spot, Medford is home to In-N-Out Burger’s only Oregon location. Sleep off the food and drink in Waverly Cottage, a Queen Annestyle cottage for rent in downtown Medford. Guests get the entire cottage to themselves. The home is on the National Historic Register and is smack in the middle of Medford’s historic district. The home itself is filled with period items and furniture and feels like sleeping in a museum. Pelton Dam sees an average of 9.85 inches of precipitation per year compared to an estimated 100 inches at Mount Jefferson, just twenty-five miles west, said the National Weather Service’s Michael Murphy. 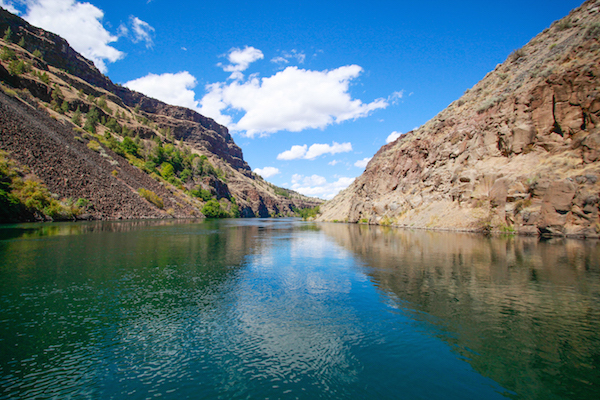 The dam, owned by Portland General Electric, holds back the waters of the Deschutes River to create Lake Simtustus. On the edge of this lake is Pelton Park, open for day-use, including fishing, year round. The campground offers sixty-seven tent sites, along with “yomes,” a cross between a yurt and a dome, equipped with futons to sleep four. The lake has a 10-mph speed limit, so it’s a laid-back site for fishing, canoeing, and kayaking anytime. Just north of Pelton Park is the Pelton Wildlife Overlook, a perfect spot to view migratory birds along with ducks, geese, herons, eagles and other birds of prey. Kah-Nee-Ta Resort & Spa in Warm Springs is on the Warm Springs Indian Reservation, just thirty minutes from the dam. The nearby Museum at Warm Springs holds a large collection of plateau American Indian artifacts, including noteworthy paintings, sculpture, masks, ceremonial clothing, ritual implements and beadwork. Madras is also home to the Erickson Aircraft Collection, a private collection started by Jack Erickson in 1983. The Erickson collection is growing and currently holds more than twenty rare aircraft, most of which are still in flying condition, including the P-38 Lightning, P-51 Mustang, Ki43 Hayabusa and B-17 Flying Fortress. On a typical mid-January day, the high in Redmond is 42 degrees and the low is 23. There may be a dusting of snow that increases as the sun begins to set. In Brookings, however, the average January high is 55 and the low is 42, despite its location on the consistently cold waters of the Pacific Ocean. This “banana belt” climate is most pronounced in Brookings, but many other spots around the state experience winters that are higher and drier than the average. Kathie Dello, deputy director of the state climate office in Corvallis, explained that Brookings is in the “elbow” of the rumpled landscape where California and Oregon meet, at the foot of the Klamath Mountains. High-pressure air presses down onto the earth, unlike stormy weather, which results from low-pressure systems. Descending air always tends to become warmer, so Brookings is bathed in warm air that barely notices its proximity to the mighty Pacific. The effect takes place year-round, and in fact, on July 8, 2008, Brookings recorded a high of 108 degrees, the highest temperature in the state that day. A previous version of this article in print and online stated: “Several cities around the state, such as Medford, 150 miles inland from the south coast, and Hermiston, 275 miles inland from the mouth of the Columbia River, are both on the eastern side of a rain shadow formed by the Cascade Range, so both are much drier, and sunnier, than the Willamette Valley.” Medford is on the western side of the Cascade Range, and its proximity to high elevations all around it squeeze moisture out of storm systems before it reaches the city. We apologize for the error. 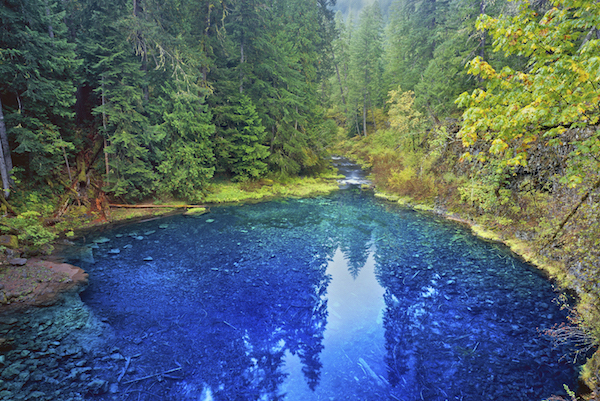 Now that you’ve explored Oregon’s warmest getaways, check out Oregon’s best winter getaways. re: Kenneth Lehto… I suspect that the distance of Medford, "150 miles inland from the south coast" was driving distance. Medford is about 150 miles from, say, Gold Beach. Of course, it is closer to 80 miles line-of-sight. The story correctly states that Medford is 'west' of the Cascades. Medford is west of the Cascades, and much less than 150 miles from the coast. Do you even live here?